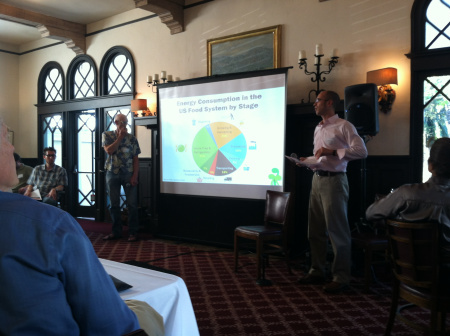 As part of the Community Environmental Council’s long running Partnership Council Breakfast series, the Santa Barbara based non-profit invited UCSB Professor and internationally renowned agri-food systems expert David Cleveland and Sustainable Food Systems Consultant and Innovator Seth Nickinson to present the findings of their pioneering research into food related greenhouse gas emissions and how they relate to both local and national food systems. While their talk specifically focused on the Santa Barbara County area, many of the ideas and concepts presented were applicable to any locale. The research presented by the duo was both enlightening and shocking, revealing often overlooked, but hugely significant sources of greenhouse gasses from food systems (growing, harvesting, processing, transport, retailing, storage, disposal, etc.). Additionally the duo presented ground-breaking research on how diet relates to greenhouse gas emissions and hence contributes to climate change. For instance, by cutting out red meat and dairy from your diet just one day a week, it would be equivalent to a reduction in greenhouse grasses comparable to switching your entire diet to only locally grown food, which, while possible, can be difficult for many people. While most scientific research done nowadays is mostly theoretical and hard to apply to real world scenarios, the research presented by Cleveland and Nickinson was at once easily understandable and accessible to those not involved in academia. Very real changes with significant environmental impacts could be made immediately if one was so inclined to simply avoid foods or decide to focus on purchasing as many local products as possible. The talk was moderated by Krista Harris, Editor of Edible Santa Barbara, a free-but-stylish-and-sophisticated quarterly magazine focused on the local, artisan food movement in Santa Barbara County. Krista’s insightful commentary and knowledgeability about all things local perfectly complemented the presentation. Anyone interested in staying up to date on the burgeoning local food movement is advised to check out her publication here: Edible Santa Barbara.